Robinson Development Group, Inc. today announced that it has secured and closed HUD 221(d)(4) construction financing for the construction of the initial phase of Cottage Trails Apartments at Culpepper Landing. The community will be managed and leased by Drucker and Falk, LLC. Cottage Trails at Culpepper Landing is a 270 unit multifamily development located in a 488 acre mixed used development in Chesapeake, Virginia. Phase I of the project is to be delivered in the Fall of 2011. The second phase is expected to be delivered in 2014. Located along the Great Dismal Swamp Canal and adjacent to a 711,000 acre wildlife refuge, Cottage Trails provides residents with luxury living in a tranquil setting with unmatched access to outdoor activities. The project is comprised of three-story, wood frame construction with a brick and Hardie Plank exterior. 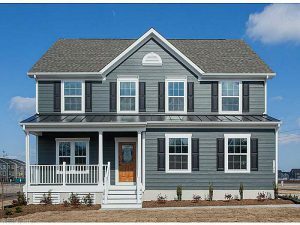 The design is of the Craftsman influence and residents will enjoy 9 foot ceilings, garden style tubs, Energy Star appliances, screened porches, and goose neck faucets. Amenities include a resort style pool, outdoor fireplace, fitness facility, bark park, and a nature trail that envelops the entire 488 acre community. Residents will also have nearby access to canoe/kayak landings, and the City of Chesapeake’s new 230 acre Deep Creek Park. Robinson Development Group was founded in 1983 as a regional development company that specialized in build-to-suit projects. Since that time, we have achieved an exceptional record of success through development and acquisitions, evident in over 6 million square feet of Class A office, retail, industrial, medical and multifamily properties.